Browse » Home » Nike » 2014 Branded Sports Warehouse Sales: Discount up to 80%! 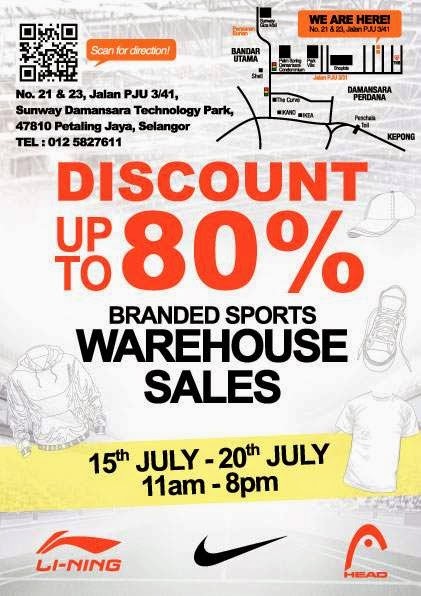 2014 Branded Sports Warehouse Sales: Discount up to 80%! Location: 21 & 23 Jln PJU 3/41, Sunway Damansara Technology Park, 47810 Petaling Jaya. Get up to 80% OFF your favourite brand of sports item! Present the hardcopy brochure and you will stand a chance to get a freebie from us during the warehouse sales! Grab the brochures from Li-Ning Retails today and be ready to bring it along with you.